On September 11, 2001, terrorists attacked the United States. Over the next 50 days and nearly 50,000 images later, White House photographers would capture the horror and heroism, the courage and compassion surrounding those attacks. From a Florida second-grade classroom to a ceremonial first pitch, these moments in time reflect the resounding resolution and resiliency of a president. President George W. Bush began his schedule that day at the Emma E. Booker Elementary School in Sarasota, Florida. Participating in a second-grade reading demonstration, he was informed by his Chief of Staff that “America is under attack.” As events unfolded in New York City, Washington, DC, and Pennsylvania, President Bush directed the nation’s response from Air Force One as he flew from Sarasota to Barksdale Air Force Base to Offutt Air Force Base and returned to Washington, DC, where he addressed the nation from the Oval Office. 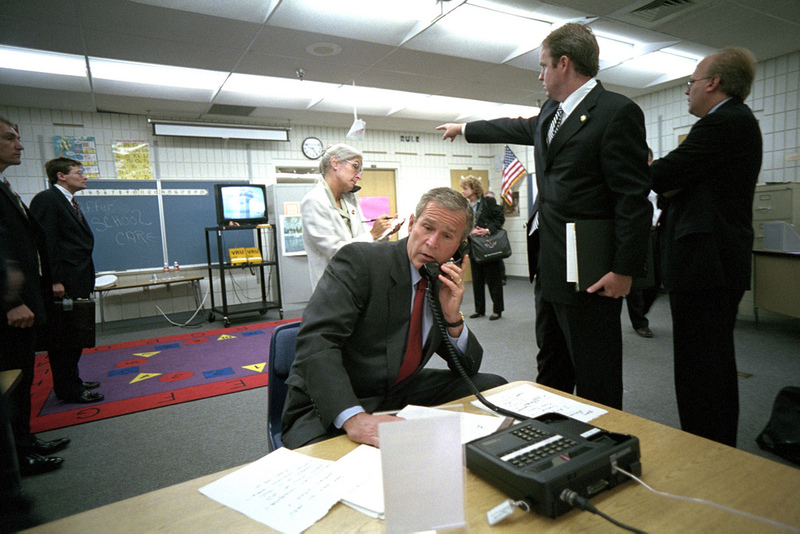 911: President George W. Bush in President's Emergency Operations Center (PEOC), 09/11/2001. 911: President George W. Bush Consults with Senior Staff, 09/11/2001. 911: President George W. Bush and Speech Preparation, 09/11/2001. 911: President George W. Bush Confers with Staff Members at Barksdale Air Force Base, 09/11/2001. 911: President George W. Bush Receives Information Regarding Terrorist Attacks, 09/11/2001. 911: President George W. Bush Takes Notes, 09/11/2001. 911: President George W. Bush and White House Arrival, 09/11/2001. 911: President George W. Bush and Vice President Cheney in President's Emergency Operations Center (PEOC), 09/11/2001. 911: President George W. Bush - Remarks to the Nation, 09/11/2001. 911: President George W. Bush Holds a National Security Meeting, 09/11/2001. 911: Andy Card and Norman Mineta Confer, 09/11/2001. 911: President George W. Bush at Offutt Air Force Base, 09/11/2001. 911: President George W. Bush Participates in a Classroom Demonstration at Emma E. Booker Elementary School, 09/11/2001. 911: President George W. Bush Speaks on the Telephone, 09/11/2001. 911: President George W. Bush and Address to the Nation, 09/11/2001. 911: President George W. Bush and Teleconference at Offutt Air Force Base, 09/11/2001. 911: President George W. Bush in Oval Office, 09/11/2001. 911: President George W. Bush Confers with Andy Card aboard Air Force One, 09/11/2001. 911: President George W. Bush Delivers Remarks on Terrorist Attacks from Barksdale Air Force Base, 09/11/2001. 911: President George W. Bush with Harriet Miers aboard Air Force One, 09/11/2001. 911: New York City Views, 09/11/2001.